Home » Calculator , Pollution » PM10 and PM2.5 levels in your city ! OK or Not ? PM10 and PM2.5 levels in your city ! OK or Not ? You are on this page because you are concerned about Air Pollution. Air pollution is measured through various criteria, but most popular criteria is PM10 and PM2.5 particulate matter present in air. Some recent studies have found that higher amount of PM10 and PM2.5 is directly related to cancer cases reported. So if you are a bit concerned about this air pollutant and want to know their level in your city then you may check it from here. Our database has got some past years data and the air pollution in most of the cities have must grown up by that time. If you are unable to find your city in this database, then checking the data of some nearby city will give you an idea about your city. Air is connected without any borders and high pollution in one city affects all nearby cities. What is recommended level of PM10 and PM2.5 for good health ? According to WHO (World Health Organisation) annual PM2.5 level should be under 10 μg/m3 , while annual PM10 level should be under 20 μg/m3 . According to EPA (United States Environmental Protection Agency) annual PM2.5 level should be under 12 μg/m3 , while annual PM10 level should be under 50 μg/m3 . What is PM10 and PM2.5 ? 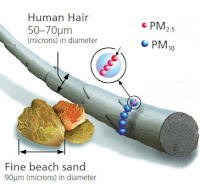 PM10 is 10 micrometers or less in diameter, while PM2.5 is 2.5 micrometers or less in diameter. Their quantity is epressed in μg/m3 (microgram / cubic meter), which indicates their density in per cubic meter of air. How does PM10 and PM2.5 harm us ? Some recent studies have found that higher amount of PM10 and PM2.5 is directly related to cancer cases reported. PM2.5 can do more harm as it microscopic and can enter into our body easily through breathing.